Katie and Chris met and fell in love in the spring of 2016 at Wake Forest University. So, it only seemed appropriate to take their engagement photos here. These two were definitely reeling from being bitten by the love bug! They are effortlessly in love. And to boot, they brought their sweet pup Salem to join the photos. Starting as acquaintances through a campus ministry called Athletes in Action. Katie played soccer and Chris baseball. 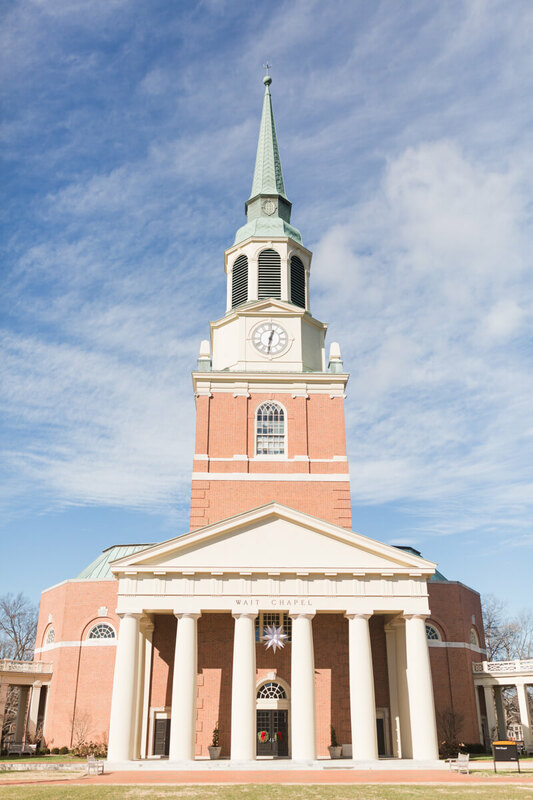 The ministry changed their lives while attending Wake Forest University, and has played a big role in shaping their love and relationship today. Chris and Katie became close friends and fell in love very very quickly. They started dating six weeks before Katie graduated. Their first year and a half of their relationship was a long distance one between Winston-Salem and Northern Nevada. They would travel back and forth on their breaks while Katie was working on her grad school prerequisites and Chris finishing school. Katie moved back to Winston-Salem in January of 2018, just before Chris graduated. Katie worked part-time for Athletes in Action, the ministry they both so loved. She was also a part-time nanny. Now Katie is getting her graduate degree at the Medical University of South Carolina in Charleston. And Chris is working for DeutscheBank in New York. So long distance again until after their wedding when they will relocate to North Carolina.